Steve Torrence drove to the provisional pole in Friday qualifying in Kent, Wash.
Top Fuel point-leader and Pacific Raceways speed record-holder Steve Torrence emerged with the provisional qualifying lead after the opening sessions of time trials Friday for the 30th annual NHRA Northwest Nationals in Kent, Wash.
Torrence wheeled his Capco Contractors dragster to 1,000-foot pass in 3.791-seconds at 324.75 mph. The 34-year-old resident of Kilgore in West Texas is seeking his third pole of the season after a win at the most recent event at Sonoma Raceway in Northern California, Round 2 of the NHRA’s annual three-race summertime Western Swing. Robert Hight (Funny Car) and Bo Butner (Pro Stock) also were provisional qualifying leaders in their respective categories at the 16th of 24 events on the 2017 NHRA Mello Yello Drag Racing Series schedule. After a breakout 2016 campaign during which he won three times and finished third in the driver standings, Torrence this year opted out of a working relationship with tuning guru Alan Johnson and put the mechanical onus directly upon the shoulders of crew chief Richard Hogan and the team of “misfits and outlaws” he has assembled. 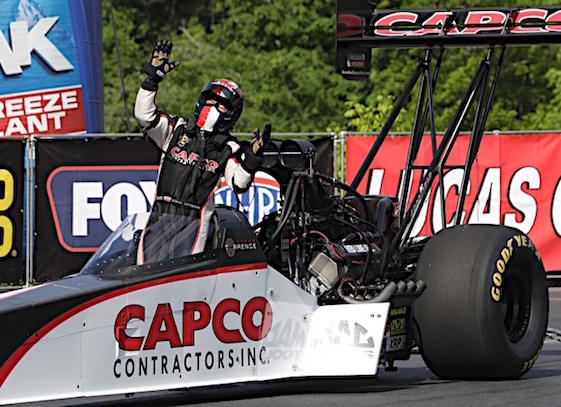 In the last 11 races, Torrence has appeared in eight final rounds with six victories, including three in the last four events, the most recent being last Sunday’s Toyota NHRA Nationals in California’s wine country. Torrence’s head-to-head record for the season is 38-9, one round-win shy of his career-best set a year ago at 39-20. Torrence qualified second last year at Pacific Raceways and defeated Scott Palmer, Richie Crampton and J.R. Todd before losing to three-time/reigning world champion Antron Brown in the final. The two share the elapsed time and speed records at the facility near Seattle. Both records were set on Aug. 7 2016 _ Brown clocked the E.T. record at 3.865-seconds while Torrence upped the speed mark to 330.47 mph. Torrence’s success is impressive considering his single-car team is competing against the most heavily-funded multi-car operations in the sport. A one-car team has not won the NHRA Top Fuel championship during the Countdown to the Championship Era, which began in 2007. Torrence is determined to change all of that and has been energized by the fact that he has become the first driver for a single car team to win six races since 2003. Torrence has posted the best reaction time average in the category and earned the second-most qualifying bonus points, behind Leah Pritchett of Don Schumacher Racing. Torrence also is one of only two Top Fuel drivers _ along with close friend Brown of DSR _ to have avoided a first-round loss while qualifying eighth or better in each of the season’s first 15 races. Torrence holds a 75-point/nearly four rounds of racing lead over Brown and his Matco Tools dragster. Brittany Force of John Force Racing is second in her Monster Energy dragster after a 3.792-second pass at 323.89 mph. Eight-time world champion Tony Schumacher of DSR and his U.S. Army dragster are third at 3.802/322.96. In Funny Car, Hight powered his Auto Club of Southern California Chevrolet Camaro SS to the top of the class during the second qualifying session with a 1,000-foot run of 3.894-seconds at 329.42 mph. The 2009 world champion from JRF, Hight is looking for his second consecutive pole. He opened the Western Swing with a victory at Bandimere Speedway in Morrison, Colo., near Denver. DSR’s Tommy Johnson Jr. is second in his Make-A-Wish Dodge Charger R/T with a pass of 3.930-seconds at 324.05 mph, while 16-time world champion John Force is third with numbers of 3.973/307.23 in his PEAK Coolant and Motor Oil Chevrolet Camaro SS. In Pro Stock, point-leader Butner recorded a quarter-mile pass of 6.584-seconds at 209.36 mph in his Jim Butner’s Auto Chevrolet Camaro during the second session to lead the field. Butner is chasing his fourth pole of the season and seventh of his career. Drew Skillman holds the second spot in his Ray Skillman Camaro after his pass of 6.603-seconds at 208.84 mph. Rookie Tanner Gray sits third in his Gray Motorsports Valvoline Camaro at 6.612/208.75. Qualifying is scheduled to resume Saturday at 4:30 p.m. (EDT). FOX Sports 1 will air Saturday’s sessions during a one-hour show starting at 2 a.m. (EDT) Sunday. The FOX network will carry three hours of live coverage of the finals Sunday at 4 p.m. (EDT). Top Fuel _ 1. Steve Torrence, 3.791-seconds, 324.75 mph; 2. Brittany Force, 3.792, 323.89; 3. Tony Schumacher, 3.802, 322.96; 4. Antron Brown, 3.813, 317.42; 5. Mike Salinas, 3.826, 319.29; 6. Shawn Langdon, 3.845, 314.46; 7. Troy Coughlin Jr., 3.854, 320.43; 8. Terry McMillen, 3.861, 279.15; 9. Troy Buff, 3.862, 309.98; 10. Leah Pritchett, 3.891, 288.70; 11. Scott Palmer, 3.989, 301.60; 12. Terry Haddock, 3.999, 283.67; 13. Shawn Reed, 4.013, 267.53; 14. Clay Millican, 4.167, 210.11; 15.Doug Kalitta, 4.658, 161.77; 16. Ron Smith, 6.917, 88.58. Funny Car _ 1. Robert Hight, Chevy Camaro, 3.894, 329.42; 2. Tommy Johnson Jr., Dodge Charger, 3.930, 324.05; 3. John Force, Camaro, 3.973, 307.23; 4. Alexis DeJoria, Toyota Camry, 3.975, 321.04; 5. Jack Beckman, Charger, 3.983, 322.88; 6. Tim Wilkerson, Ford Mustang, 3.990, 322.04; 7. Matt Hagan, Charger, 3.999, 322.19; 8. Cruz Pedregon, Camry, 4.006, 311.49; 9. J.R. Todd, Camry, 4.009, 322.88; 10. Ron Capps, Charger, 4.019, 319.37; 11. Jonnie Lindberg, Camry, 4.053, 318.32; 12. Jim Campbell, Charger, 4.064, 305.08; 13. Del Worsham, Camry, 4.111, 311.41; 14. Courtney Force, Camaro, 4.187, 230.33; 15. Gary Densham, Mustang, 4.238, 286.92; 16. Jeff Diehl, Toyota Solara, 7.177, 95.62. Pro Stock _ 1. Bo Butner, Chevy Camaro, 6.584, 209.36; 2. Drew Skillman, Camaro, 6.603, 209.07; 3. Tanner Gray, Camaro, 6.612, 208.75; 4. Erica Enders, Camaro, 6.614, 209.49; 5. Jason Line, Camaro, 6.615, 209.75; 6. Allen Johnson, Dodge Dart, 6.617, 209.52; 7. Greg Anderson, Camaro, 6.637, 209.69; 8. Vincent Nobile, Camaro, 6.646, 208.42; 9. Jeg Coughlin Jr., Camaro, 6.662, 207.78; 10. Alan Prusiensky, Dart, 6.680, 207.30; 11. Matt Hartford, Camaro, 6.684, 207.30; 12. Steve Graham, Camaro, 9.880, 93.42; 13. Chris McGaha, Camaro, 10.955, 81.32.